Performability engineering offers a framework to incorporate dependability and sustainability, not only to optimize the technical performance of the products, systems, and services, but also to optimize the processes that produce them. As we move into the 21st Century, it has become obvious that the problems of dependability and sustainability cannot be considered in isolation as they are closely interlinked and must be fine-tuned at every stage of life cycle activities which include design, manufacture, use, maintenance, and disposal. International Journal of Performability Engineering (IJPE) was started as a quarterly journal in 2005 (close to 200 pages) until 2009 (with about 500 pages). It became a bimonthly journal from 2010 to the middle of 2017, six times a year (January, March, May, July, September, and November). It also had a few special issues between regular issues. The annual total number of pages ranged from 600 to 770. Since September 2017, IJPE has moved one step forward to being published monthly. This shows how IJPE has progressed since its inception in 2005. 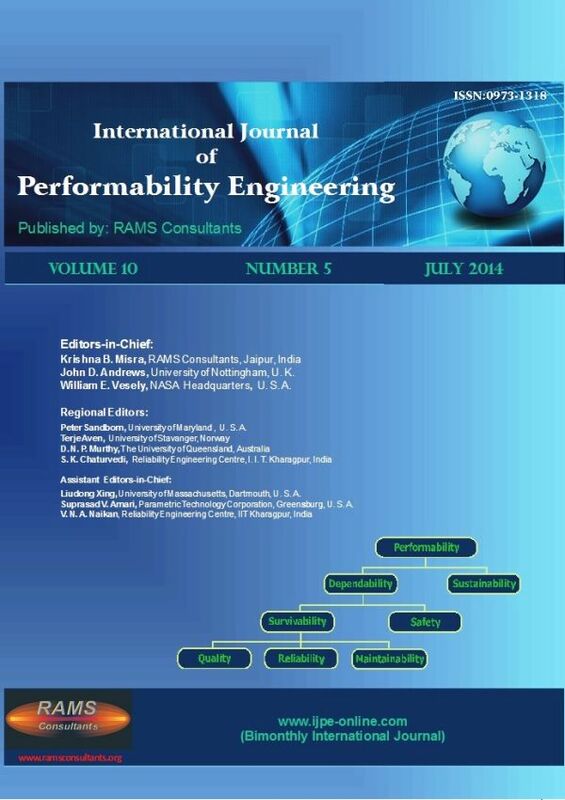 The Editorial Board of IJPE is comprised of some of the most distinguished professionals in the world who are well-known in their respective areas and bring their rich expertise to this journal from various realms of performability engineering. All papers published in IJPE are subjected to a review process and are accepted only when they satisfy the reviewers’ expectations of excellence. IJPE has been appreciated and well received by the scientific community. This is reflected through the demands/orders received for copies of papers published in this journal. We will continue to keep the standard of IJPE very high and strive to provide excellent quality papers to our readers. We emphasize that the published papers must either present results from state-of-art research or discuss usages and experiences from state-of-practice techniques. Inspired by Phenomenal improvement of quality and reliability of Japanese products during 20th Century, K. B. Misra (born 1943) took to reliability engineering as his career in 1967 and tried to emulate the same success in India to improve India manufactured products. He is an engineering graduate from M.S.Unversity of Baroda and M.E., Ph.D. of University of Roorkee (now IIT Roorkee) where he became a full professor in 1976. He delivered lectures in industries to popularise the reliability concepts and moved Government in 1976 to set up a NCST working Group on Reliability Implementation programme in India. This DST group brought out two reports in 1978, which somehow due to lack of support from the then Central Government didn't progress beyond setting up of a task force committee. He then turned to academics to advance the discipline in institutions and published extensively in international journals besides having distinction of serving on the editorial boards of several reputed international journals on quality, reliability and safety, including IEEE Transactions on Reliability for several years. Reliability Society of IEEE USA honoured him by awarding him a plaque for his contributions to research and education in the area of Reliability. In 1980, he shifted to IIT Kharagpur where he started the first ever postgraduate programme on Reliability Engineering in India in 1982 and established Reliability Engineering Centre at Indian Institute of Technology, Kharagpur, India in 1983. This centre has the distinction of producing several illustrious postgraduates in Reliability Engineering, who are contributing their best in various prestigious organizations in India and abroad. After his retirement from IIT Kharagpur in 2005, RAMS Consultants, was founded by Professor Krishna B. Misra at Jaipur, India and started publishing International Journal of performability Engineering from Jaipur as a part of RAMS Consultants activities. Prof. Misra has had four decades of teaching, consultancy and research experience in reliability and has published extensively. He has five books to his credit. Having had such a rich experience, he began to perceive a need for a more integrated way of looking at reliability and related performance attributes. Performability engineering offers a structure envisioned by him to solve the performance related problems of products, systems and services that we shall face in 21st Century (what Indian Prime Minister Narendra Modi has called upon nation in order to improve economy of the country by improving of Indian products with " Zero defect" and "Zero environment effect" in his speech to Nation on August 15, 2014). Prof. Misra's recent book of 1316 pages, Handbook of Performability Engineering published by him in 2008 is a tribute to this vision.